While white mice, white rats and white rabbits are generally albino forms of those animals, white dwarf hamsters, better known as winter whites, are actually a separate species. They have white coats for part of the year not because they lack pigmentation genes; it is an adaptation to their natural habitat. Like arctic foxes, winter whites turn white to become inconspicuous against the snow. The winter white hamster goes by several names, including Siberian (not to be confused with the much larger Syrian hamster), Dzhungarian or Djungarian, and Russian winter white. These all refer to the species Phodopus sungorus. Winter whites are closely related to, but not a variant of, the Campbell’s dwarf hamster (Phodopus campbelli). The defining characteristic of this species is the winter coat, which is snowy white with some light gray markings. This is usually shed in the spring to reveal a much darker hamster. Pet winter whites now come in several summer colors, including the wild black-and-gray palette, a blue-gray form and a year-round white coat. Other variations may actually be crosses between the winter white and Campbell’s dwarf, according to the Southern Hamster Club. Winter whites are native to the steppes and dry deserts of Siberia, along with a couple of areas in Kazakhstan and Russia. They don’t hibernate during the cold winters; instead they survive by becoming fatter and of course by developing the white coat so predators can’t see them easily. Their diet consists of whatever nutritious things they can find, including insects and seeds. Winter whites are not an endangered species, with the International Union for the Conservation of Nature listing them as of “least concern.” Almost all those in captivity were captive-bred. The winter white is a little bigger than a mouse, reaching a maximum length of four inches. They reach sexual maturity at just over a month old and like many small rodents they reproduce rapidly: one female hamster can have up to six litters a year, with as many as 12 babies in each one. For obvious reasons, you should separate the genders in captivity. Their life spans are comparable to those of other hamsters: the average is about two years, two and a half on occasion. The bigger the better is the rule of thumb for the cage. The only thing to be careful about is the width between the bars. While a general hamster or rat cage is usually fine for adult winter whites, juveniles might be able to squeeze through the gaps. Basically, if the head gets through, the rest of the animal can follow. Basic furnishing includes a deep layer of a safe substrate, such as paper pellets or chemical-free potting compost, cardboard or plastic nest boxes and all the usual hamster accessories, including a wheel, a water bottle, a food bowl and cardboard tubes. Winter whites should be kept in single-gender pairs or small groups because they are highly social. Care is straightforward, as their requirements are not very different from those of other hamsters. Provide food and change the water daily, clean the cage out once a week or more frequently if it is small and visit your vet as needed. 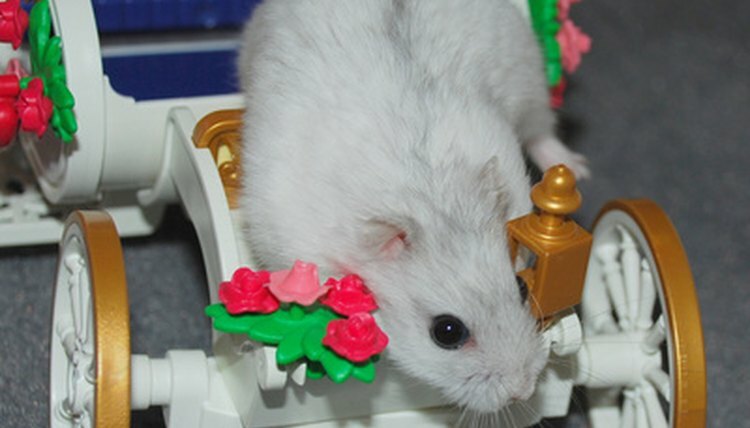 One thing to note about dwarf hamsters in general is that they are prone to diabetes. Don’t feed your pets much fruit, which is high in sugar, and definitely don’t provide sugary human treats like candy. What Kind of Rabbits Are Calico Colored Ones? What Animals Interact With the Eastern Chipmunk?